At Rasmussen Dental, we’re here to improve your smile, even if it’s not as white as it used to be. Whether you want a confidence boost or just to look your best, whitening remains the most requested cosmetic dental procedure. While most professional whitening methods work extremely well, even the best treatments sometimes don't work on severely stained teeth. But now, with our new procedure, even drastically stained teeth can go brilliantly white. If you've ever been disappointed in the results from other methods, you will be amazed at this new technique. We also offer the traditional at-home tray bleaching. This procedure is safe and effective. Results occur within 1 - 14 days. Get brilliantly white teeth in one appointment! LIMITED TIME OFFER! We are offering Philips Zoom in-office whitening to patients, which includes custom trays and a take-home whitening kit for $299 with a $50 rebate. If you have misshapen teeth, unsightly gaps, deep discoloration, or other problems that make you too embarrassed to smile, porcelain veneers may be the answer. Veneers are very thin, but super-hard, coverings that fit over and are bonded to your teeth. They look so natural that even dentists have to look closely to notice them! 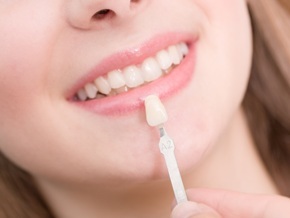 Think that cosmetic veneers are right for you? Call us today at (763) 553-1125! At Rasmussen Dental, we practice general, family, and cosmetic dentistry and we want to help you replace your lost teeth. Unlike bridges or removable dentures, which sit on top of the gums, dental implants are placed under the gums. After an oral surgeon or Dr. Rasmussen places a titanium post in place of the missing tooth, Dr. Rasmussen will custom-create natural-looking dental implants that will replace your dentures with teeth that are solid enough to eat any food! Very similar to invisalign, our MTM Clear Aligners are an alternative to traditional braces. Choose Rasmussen Dental and get a perfect smile without the embarrassment of metal braces!